Wrapped in Ruffles + Target $200 Giveaway Winner Announced! Oh how much I love this outfit worn to work. Keeping stylish with negative temperatures and a ton of snow, is hard. But Winter layers don't have to be boring. My outfit today is a proof of that! This outfit has mostly neutral colors like black, navy and brown (maroon blouse) but it has textures like suede (Wrap Mini Skirt), real leather (Over-the-Knee Boots), faux snakeskin (Bright Coral Clutch) and tiered ruffles (Elbow-Sleeve Blouse). This outfit also features brands I love and shop at a lot. My OTK Boots are from DSW. 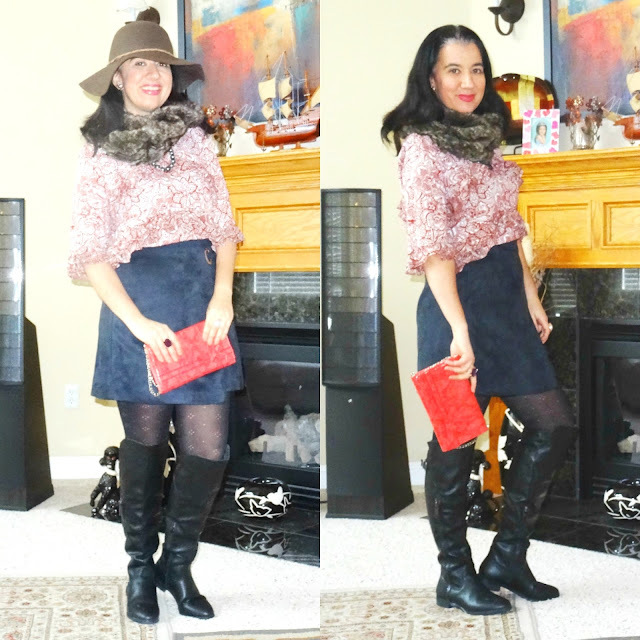 The Mini Skirt and Patterned Black Tights are by Loft. The Blouse is by Who What Wear via Target. The Studs are by BaubleBar. The Necklace and Pearl Cocktail Ring are by The Limited (a brand I loved when they were in business) and the Snakeskin Clutch is by White House Black Market. THE NAVY SUEDE WRAP SKIRT. You can always count on Loft for cute, unique, fun skirts, especially mini skirts. Purchased a few months ago, this Faux Suede, Navy, Wrap-Style Mini Skirt is one of my favorites pieces. It definitely makes a statement and it is truly a beautiful piece. Plus it is the softest suede material. The navy color makes it go with so many colors. I can picture this skirt with red or bright yellow on top - it would look great! What do you think?! This Beautiful Chiffon Maroon Floral Blouse with the tiered ruffles is by Who What Wear via Target from about a year ago. I cannot believe I have only worn this blouse one more time prior to this. It finally made it into the blog. I love the feminine yet classy tiered ruffles and the length of the sleeves which makes the blouse perfect, year-around. This blouse is also pretty long so it would look great with pants and skinny jeans too. And look my Purple/Maroon and Silver Cluster Stud Earrings by BaubleBar match the blouse perfectly. 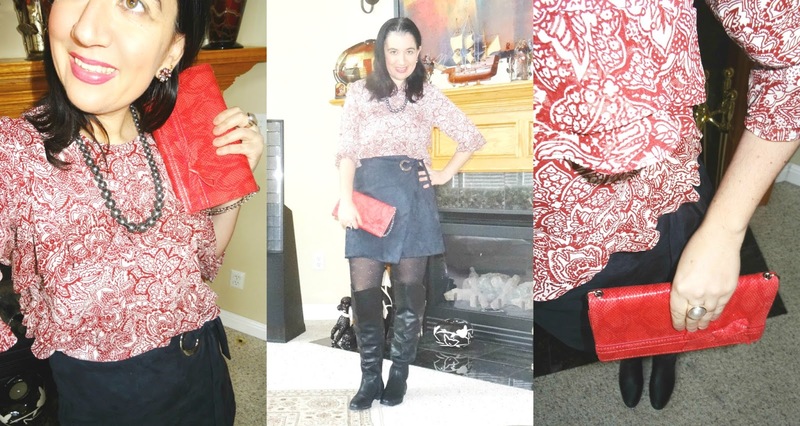 I also love that I carried my Bright Coral Faux Snakeskin Little Clutch with this outfit. I love the pattern-mixing it created with the blouse. You know what else, this outfit would be great for Valentine's day coming up. It can take you from work to a fun dinner date afterwards. It does double duty from day to night. If you missed my weekend posts, there were two fun ones. First I shared a little poetry and I hope you like it. I will be posting a few more poems every now and then, so please read it! Secondly, I did a Flashback Friday post where I recapped 16 cute Valentine's Day Outfits. There is something there for everyone so check it out! Last but not least here is the $200 Target Giveaway Winner. I will be emailing Amy in a little bit. I am happy to know Amy is the Target giveaway winner because she has been a big supporter of my blog since when I first opened it about 6 years ago. Amy is a fellow European who lives in America (and used to live in Michigan) and she is a new mom to a beautiful little baby girl. Congratulations to Amy once again and thank you to everyone who entered my Target $200 Giveaway. Have a great Monday!